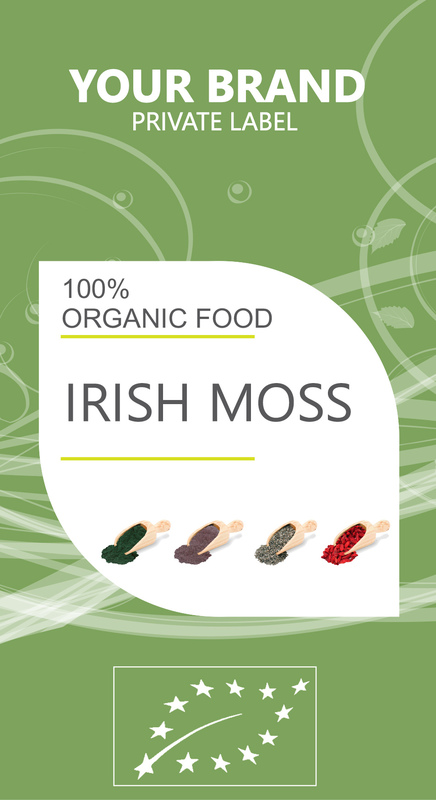 IRISH MOSS is a species of red algae which grows abundantly along the rocky parts of the Atlantic coast of Europe and North America. In its fresh condition this protist is soft and cartilaginous, varying in color from a greenish-yellow, through red, to a dark purple or purplish-brown. The principal constituent is a mucilaginous body, made of the polysaccharide carrageenan, which constitutes 55% of its weight. The organism also consists of nearly 10% protein and about 15% mineral matter, and is rich in iodine and sulfur. When softened in water it has a sea-like odour and because of the abundant cell wall polysaccharides it will form a jelly when boiled. It is used as a natural thickener vegetable origin. Irreplaceable mainly in many of unleavened dishes, giving them distinctive and concentrated gelatinous structure. Whereas the latter is in a "raw food kitchen" typically uses large amounts of nuts or coconut fat, irish moss is an ideal way to avoid such high doses (even vegetable) fat. Too much concentrated food at a time, even if flora and healthy, does not mean anything good for the body.